Join us for our chili dinner fundraisier, Feb. 1 at 4 pm. 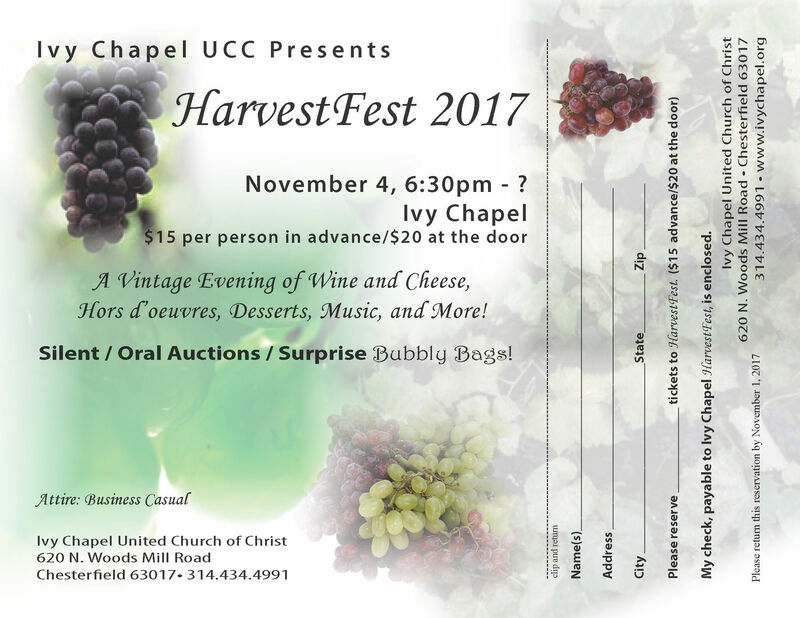 You’re invited to the Ivy Chapel Chili Dinner. It’s a great way to chase away the winter blues and help raise money for Ivy Chapel’s programs. Tickets are $10 for adults and $5 for children. Checks may be made out to Ivy Chapel UCC. We’re also holding a raffle with great prizes like grocery and restaurant gift cards, gift baskets and more. Email us if you’d like to donate an item. Want to help with the event? We need people to help make desserts and to decorate tables. Let us know if you can pitch in. Trunk or Treat, something good to eat! Everyone is welcome to join us for our annual Halloween Party and Trunk or Treat October 28 starting at 4 p.m. It’s a safe, fun fellowship event. We’ll have candy & goodies (of course), along with a hot dog roast and other scary activities under the pavilion! Ivy Chapel members who want to provide treats for the kids should arrive around 3:30 to decorate their cars in the upper parking lot. Everyone is encouraged to dress up. Want to join us? Need to know more? Send us an e-mail and we’ll fill you in on the details.